Here at Cliscep we’re suffering from battle fatigue following a long and tedious failure to start a discussion at Lewandowsky’s latest oeuvre. (More on that in a later post). Meanwhile, over at the Australian version of the Conversation, John Cook was launching a counterattack. Janeen Harris: The conspirators are the right-wing think tanks… It’s a case of mass delusion and insanity, fueled by greed and arrogance. Ross Barrell, Aikido student: I think it goes beyond that, Janeen. To my mind it is more like the evidence for something like AGW is a direct threat to the world view of these people. I think it is almost an existential threat and this might explain why denier trolls become ever more strident and irrational in their denial as the evidence mounts. Henry GRAY: I could not agree more Janeen. The main picture tells it all. There is no place for authorities to be like lame ducks or denying ostriches. Brad Farrant: Great article, thanks John. I think you are right Ross, there are a number of people who comment here who somehow think they are being rational when they argue that the overwhelming majority of climate scientists are all involved in a giant conspiracy (they will also tell you that anyone that doesn’t believe in this giant conspiracy is an irrational, anti-science, Gaia worshipping, left-wing extremist). Henry GRAY: We delude ourselves if we think the world is not becoming more climate challenged. I often wake and feel a fear and foreboding about our climatic future and the macabre machinations of weather being increasingly unleashed. “There is no place to be denying ostriches” – Brad, you’re a genius. Tags: conversation, Cook, Lewandowsky. Bookmark the permalink. I see that the “Community Manager”, “Cory Zanino” (or is that just another incarnation of Brad?) realised they were being fooled and closed the comment thread after only about 12 hours. I am reminded of the famous Alene Composta, who ran a blog called Verdant Hopes, where she declared that her interests included womens climate issues and brown rice. She wrote to Lewandowsky saying that she was so upset by the “monsters” and their nasty comments that “I hugged my little cat and cried for an hour”. She got sympathetic responses from Stephan and from John Cook. Also discussed by Jo Nova. Lewandowsky brought up this attack on science at the Royal Society, no less. I replied to this email as follows: “… they [commenters] are like the school bullies whom no one really liked and who didn’t really have close friends, only followers. I deal with those comments and actions largely by ignoring them… Bear in mind that a proportion of those comments is orchestrated and for all we know there are only a handful of people with multiple electronic ‘personas’ each, who are paid to create disproportionate noise.” [Emphasis added]. With Ian’s assistance, I think it’s fair to say we’ve attained the upper limits of human comedy. A character called simply R. Ambrose Raven. 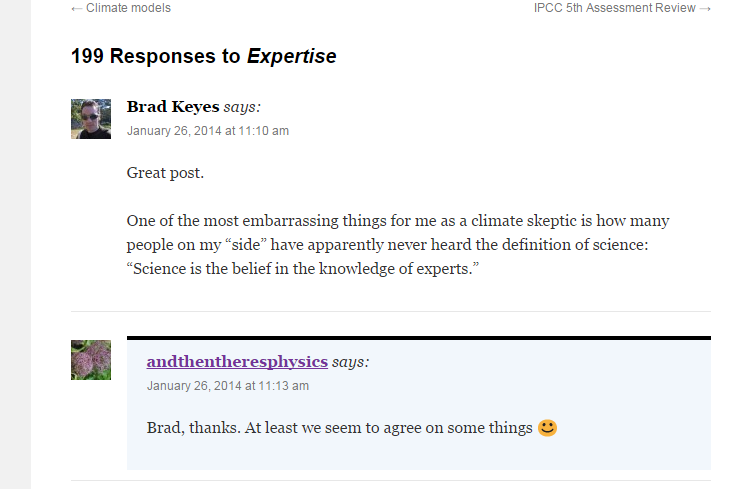 “Ah, the denialists. “Denialism” refers to those who use spurious reasoning plus more or less aggressive forms of discussion to strengthen opposition to a theory despite not having any reasonable scientific basis for doing so. Not only can’t we can’t advance any such debate by trying to reason with inherently unreasonable people, but also we must recognise that their aim is to wreck discussion and block consensus on action. Theirs is not harmless vandalism. Sorry, I don’t even think I can get through the rest of the paragraph. It’s too good.